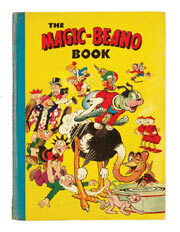 1944 MAGIC-BEANO MAKES £2,148.00; 1943, 1945 MAKE £1,060.00 EACH -- SEXTON BLAKE YEARS PASS £1000 FOR THE FIRST TIME. 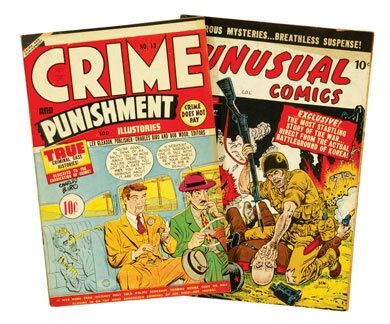 A few years ago the above prices would have been thoroughly respectable for first issue Beano and Dandy annuals but the war years have always been scarce and values are increasing, especially copies with bright boards. By contrast we had offered a Dandy Monster Comic 1 but this copy had some restoration to the spine and although the spine illustration was original it sold just below reserve at £1,045. 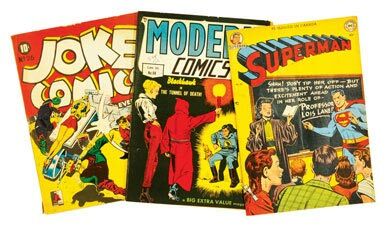 High grade is always a major factor for collectors and a reasonably estimated (£300-350) Dandy annual from 1948 with the wonderful Korky Puppeteer cover finished up at £817.00 without pulling too many strings. 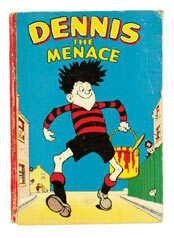 Low grade early Beano comics between issues 19 and 26, with edge chips and file-holes, sold in the region of £150 each with 27 and 28 making £118 apiece in the same condition. 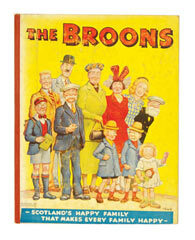 The Broons Books above were the last two issues we had with the rare hard back covers and the 1950 copy justified the family's proud photo-opportunity cover with an astounding £1,225 winning bid, a record for a 1950s piece. 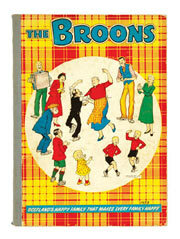 1954 had Maw n' Paw doin' The Highland Fling for a double estimate £565 to boot. 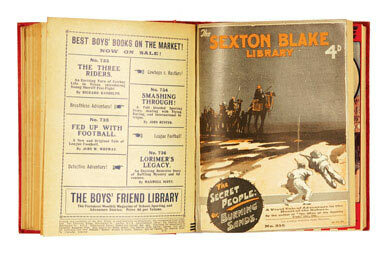 Our bound volume collection moves from strength to strength, ably led by Sexton Blake, (no longer the cheap understudy to the chap with the deer-stalker and his doctor friend), with Library volumes comprising 1924-5 and 1932 finding winning bids of £1,155 and £1,050 each. Our eight Sexton Blake lots found successful bidders in the USA, Canada, Australia, Italy and the UK, confirming his global appeal. Girls' Libraries continue to mature with prices in all cases surpassing upper estimates - Top marks to the girls! Please check our Prices Realised section for all details. A further selection will be on offer in early September. The Eagle found strong appeal with a fn- copy of No 1 fetching £203 and No 2 a soaraway £140, a record for this issue. 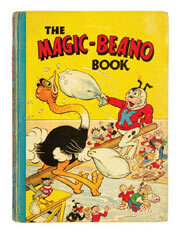 The first Eagle annual very rarely comes along in decent condition. The red covers used to mark and scratch easily with the orange undercoat showing garishly through. We offered an example in fn grade with only a faint scratch on the back and it sold for a lowly £47 - a real bargain for the purchaser, and proof that high quality doesn't always have to cost the earth, or even Venus. 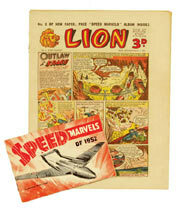 The supersonic success of Eagle led to Amalgamated Press publishing Lion in 1952, Captain Condor desperately trying to hang on to Dan Dare's Hulton Pressed coat-tails. Running until 1974, Lion built up a strong character following of its own, finally swallowing the Champion in 1966 and the now balding Eagle in 1969. 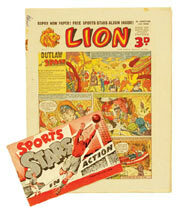 The first two issues, photos above, had free gifts on offer as well and were taken to £132 and £77 respectively. We also sold a No 3 in fn- grade for £44 and although these prices were new records for the title, they will stand as a bench mark for firmer valuations in the future. 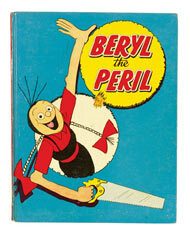 Illustrating once more that grade is everything, Beryl The Peril's first annual sawed to a record £170 in vfn grade whilst Dennis in a lowly vg-, looking like Gnasher had nibbled his extremeties, struggled to £33. 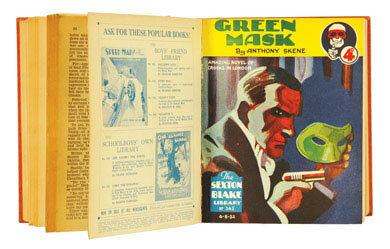 All collectors of 1950s comics are familiar with Cowboy, Super-Detective and Thriller Picture Library issues. 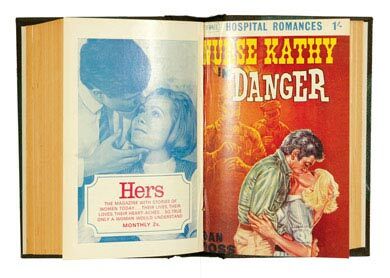 When the words Love and Romance came in to the title the girls' comic market, although far smaller, was nevertheless the target. Now collected as rarities due the correspondingly lower print runs, the scarce Love Story Library All In Pictures commanded a massive £880 covering 110 issues in six bound volumes between 1-228. Even more esoteric was Newne's Hospital Romance Library which only had text stories but 74 issues in eight volumes made £935, nearly £13 each and number one wasn't even included! More new titles will feature in September. 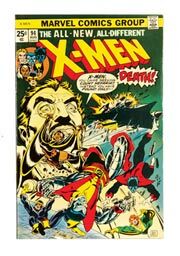 Our US section started with a selection of Canadian reprints. 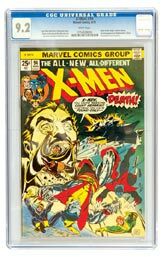 Once maligned as cheaply printed throwaways of their American counterparts, some of the issues only had the cover in common, often containing earlier, rarer stories. 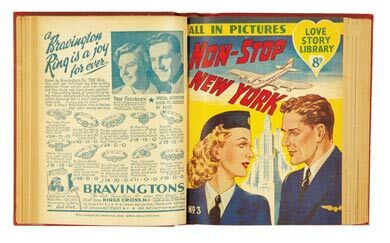 The 1940s titles featured above made over £10 each in lower grades where a few years ago they could be found for a couple of quid each. More of these also in September.